If you don’t feel like you’re able to create your own graphics for icons, you can always take a look at our themes! 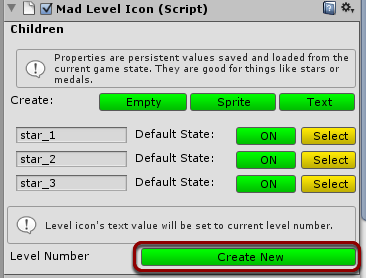 While using Mad Level Manager you can find several icon templates that can be used in your game, but most probably at the end you would like to create your own customized icon template. Here you can learn how to do it. 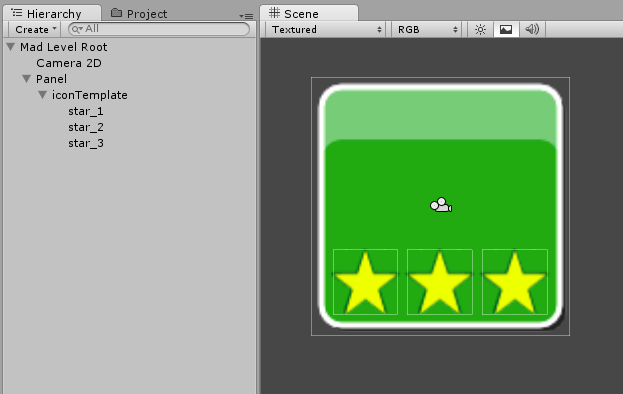 For presentation purposes I will use example textures that are provided with Mad Level Manager package. 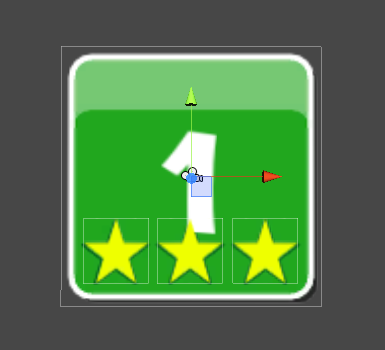 The best approach to create a new icon is to do it on completely new scene. 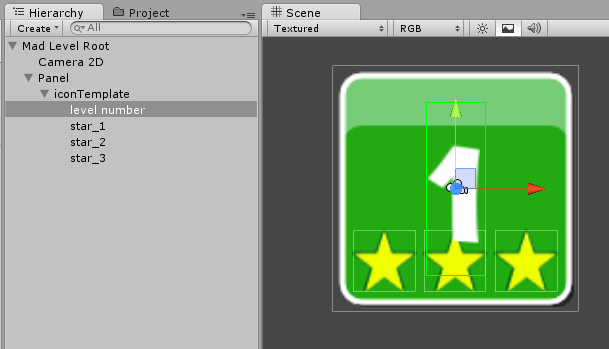 Create a new scene (CTRL + N) and remove the Main Camera from it. Make sure that Screen Layout is set to None and press the Create button. 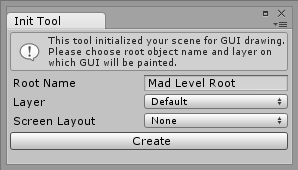 Scene will be initialized with Mad Level Root object. 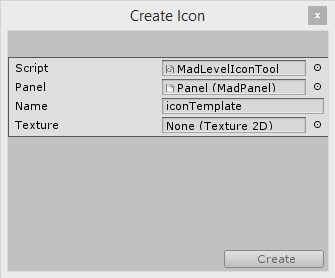 Select the texture icon to icon.png. 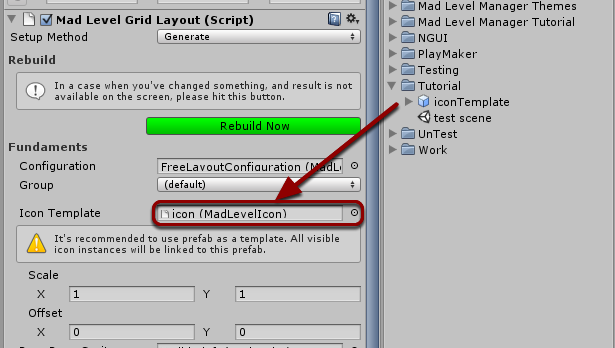 It can be found in Mad Level Manager/Examples/Textures/Example1/icon.png . Submit by pressing the Create button. 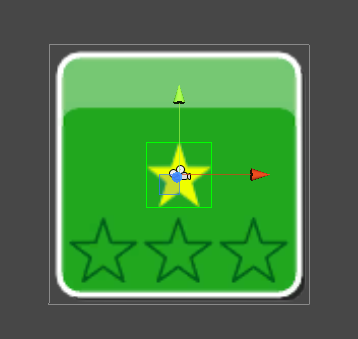 Star icons that are visible when player gained some meaningful score. 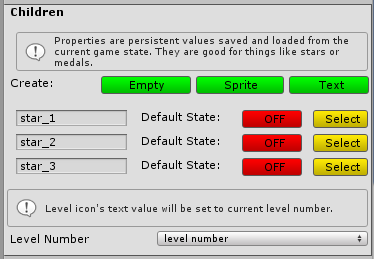 Empty – this is just a game object that is enabled/disabled based on current property state. 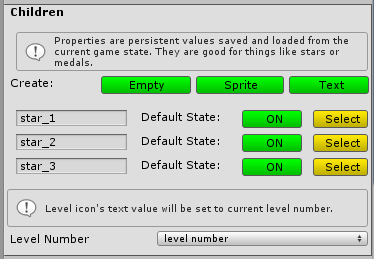 The difference between property and non-property elements is that the first one will be enabled and disabled based on a current game state. If you only want a sprite or text element that shouldn’t be hidden from your icon, make it non-property value. 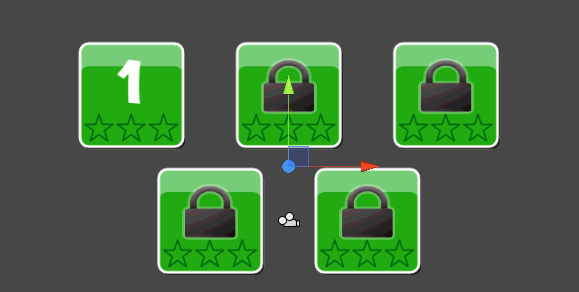 In this example we’re using stars. You’re not bound to stars only. Your properties can be whatever you want! Properties names are important. You will refer to them using the API. 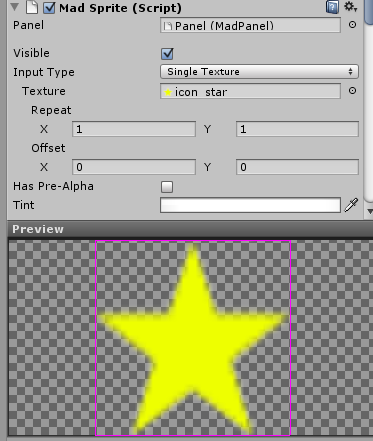 And set it to icon_star.png that can be found in Mad Level Manager/Examples/Textures/Example1/icon_star.png. 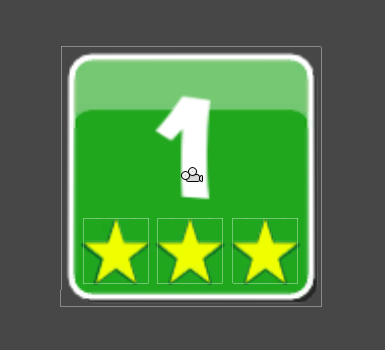 A new property will be created as before, but this time it’s called level number and actually you will see a “1” on the top of your icon. What you may want to change in the future is the font used. 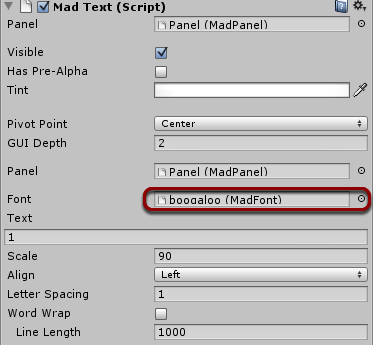 Do not change the Text field, because it will be updated automatically. 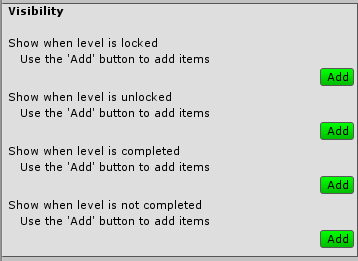 One last thing to set is the locked sprite. 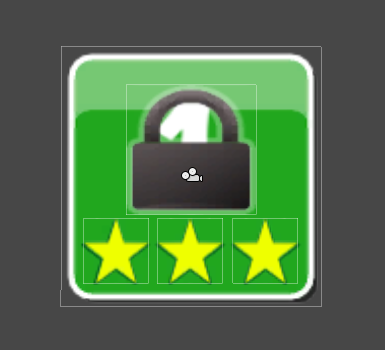 You may want to lock your levels and unlock them on player progress. Let’s set it up now! 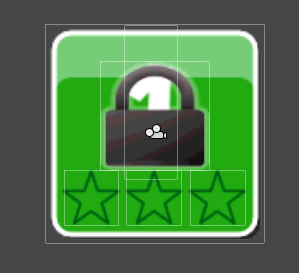 Locked icon shouldn’t be set as a property, because it will be controlled by Visibility settings. You will learn about that in a moment. 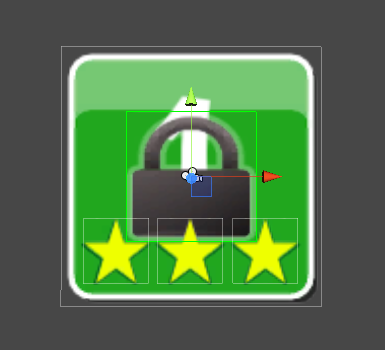 Name it locked and set the Texture to lock.png that can be found in in Mad Level Manager/Examples/Textures/Example1. Adjust its position and you’re done here! Haven’t you found out yet where to put our locked and level number objects? 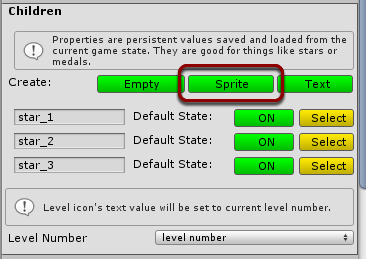 Use the Add buttons to add new items, then use the drop-down menus to choose the right sprite. 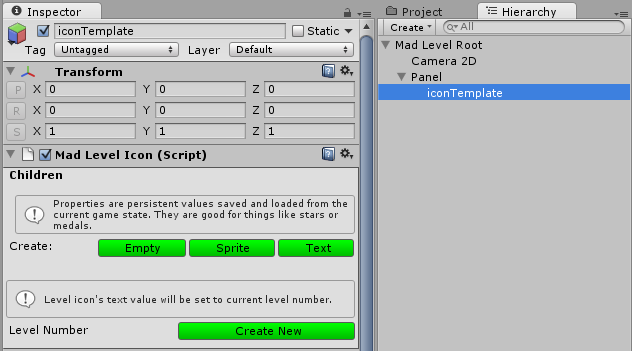 If you’re not seeing the sprites mentioned, please make sure that you’ve created them correctly and they are placed under the iconTemplate in the Hierarchy. Your icon should now look like this. Don’t worry about the lock and level number displaying at once. 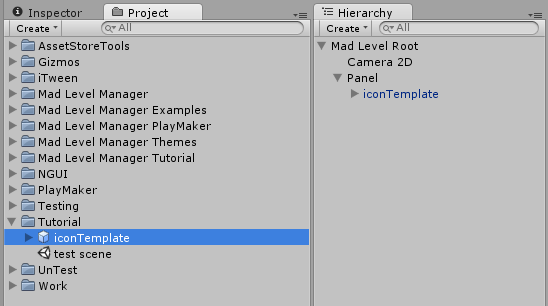 When the icon is instanced, one or another will be hidden based on Visibility settings from before. 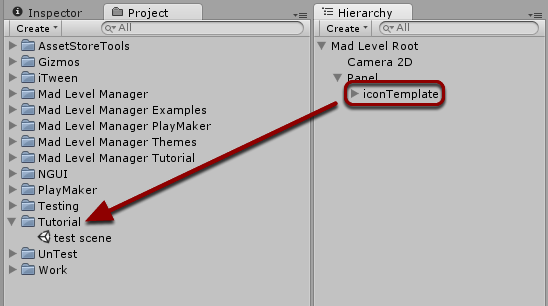 …just by moving your iconTemplate object onto any directory. The prefab will be created automatically. 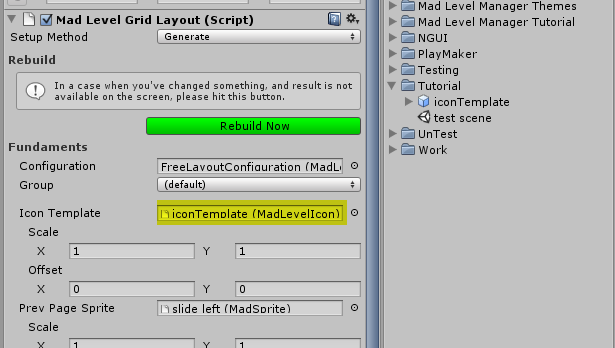 Then create a completely new scene, initialize it with Grid Layout and move your icon prefab into Icon Template field. And your scene should be updated automatically. The last thing that you need to do is testing it in play mode! 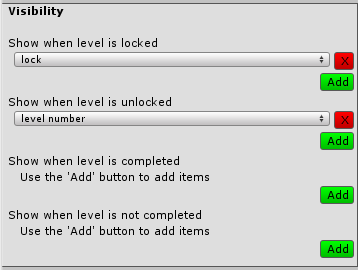 Save your scene, make sure that Level Configuration has your new scene set as “level select” level and have fun! 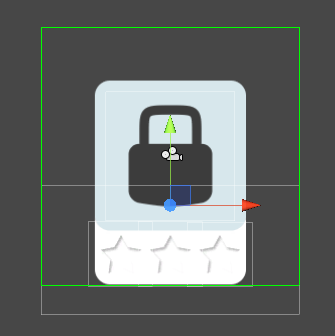 While working on your custom icon you may find out that icon hit box is bigger than it should be. In the result clicking on one icon may activate the one next to it. It will have its border set far away the visible image borders. 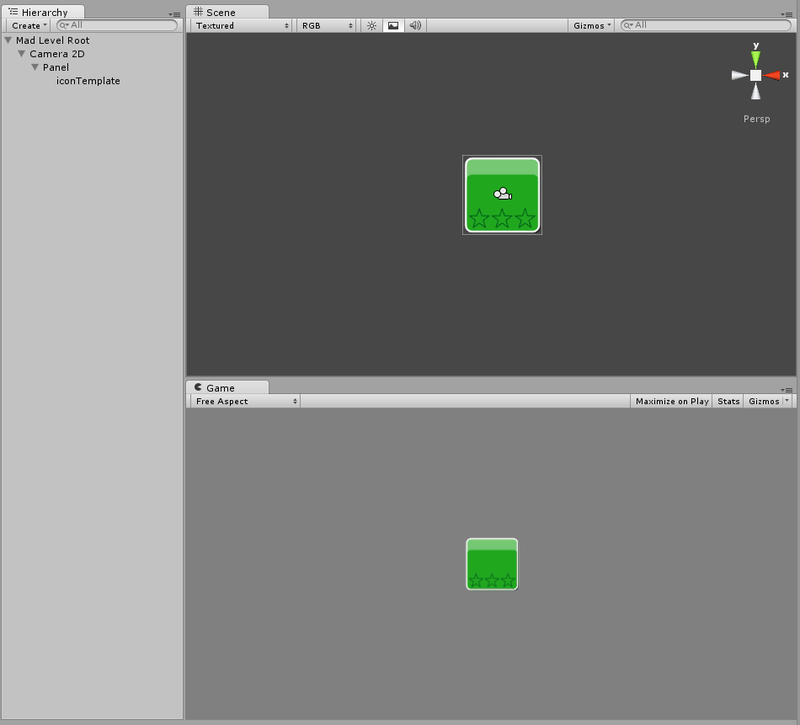 Mad Level Manager displays current sprite texture size using gray rectangles and current sprite border as green rectangles. 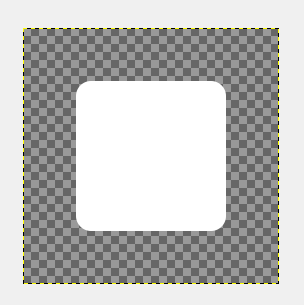 They will help you understand how big texture is and how its border (hit box) currently looks like. 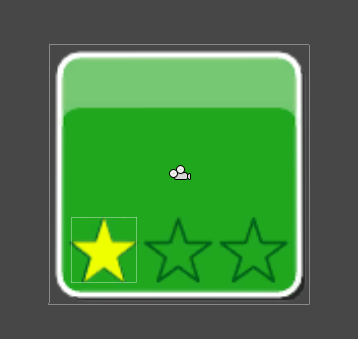 You can see that sprite border is too big and it needs an adjustment. 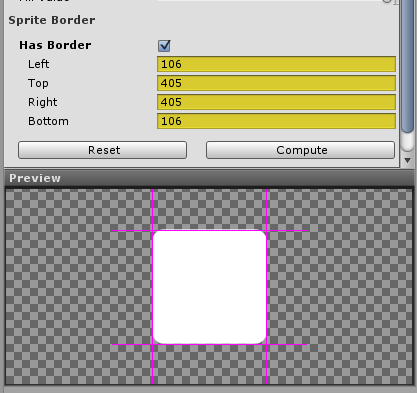 Go to the Inspector view and under the Sprite section you will find border settings and sprite preview. 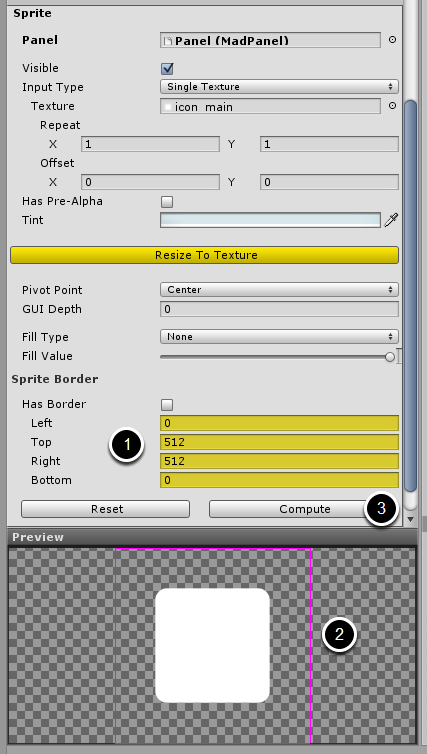 Sprite Border section when you can preview and adjust sprite bounds. 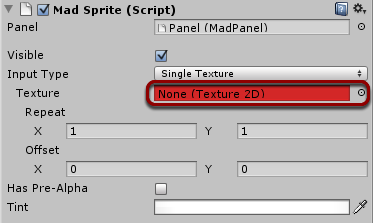 Usually the easiest way to setup sprite bounds would be by using the Compute button. If the result is not satisfying, you can also try to adjust it manually. When the bounds are set, you should no longer encounter any problem with your icons hit boxes!